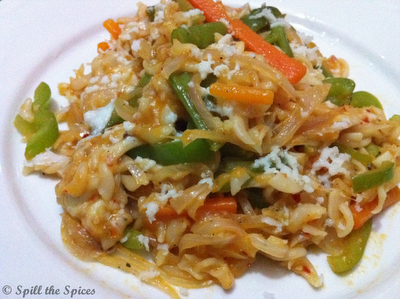 Pasta and vegetables cooked in a tomato and cheese sauce seasoned with Italian herbs and red chilly flakes. Second Blog Hop Wednesday!! After the first blog hop, I was eagerly waiting for the next. This time I am paired with Kalyani of Sizzling Tastebuds. I have been following Kalyani's blog for quite sometime and was excited to be paired with her. Her blog has an amazing collection of recipes and I had a tough time deciding which recipe to choose from her blog. This time I thought of choosing something different from the usual stuff I have already posted in my blog. I finally settled on the Cheesy Veg Pasta. 1. Cut carrot and beans into 2 inch thin strips and boil in salted water for 10 minutes. 2. Cook the pasta according to the instructions given in the packet. Blanch the tomatoes and puree them. 3. Heat a wok or pan and add olive oil. Add garlic and fry for a minute. Then add onions, capsicum and fry till onions turn pink. 4. Add the tomato puree, boiled vegetables, salt and mix well. 5. Now add the cooked pasta, grated cheese and mix on a low flame. 6. Add the dried herbs, red chilly flakes and stir. Garnish with grated cheese. Mouthwatering here, wish to finish that whole plate rite now..
Yummy Pasta Sona, my daughter is lover of cheesy pastas. Looks simple & delicious too Sona! Wow. That looks very inviting. The platter looks so delicious loaded with nutrients Sona. delicious veggie pasta...loved it absolutely !!!! Great Pasta. Should try this out sometime. Visit my recipe Mango Bread Laddoos during your leisure time. Very nice twist to pasta...love it. Tempting pasta sounds like a veggie lovers delight.